Self Split drive arrangement where the power tube triodes also function as it’s own Phase Invertor. The first triode drives the second one through the common cathode connection. The TriFly uses a Heyboer M-27 steel output transformer with 4 and 8 ohm output jacks. This transformer gives the TriFly an excellent bottom end with a thicker sound and also it had fantastic clean tone at low levels. A Conjunctive filter is incorporated into the output stage to smooth out the overall response. The eyelet board for the TriFly is a new design approach. We located the tubes in the middle of the chassis with holes through to feed the components directly to the tube pins and we used regular tube sockets. The tubes are aligned so the heater connections are closest to each other. This is a very compact and very quiet design! What differentiates our kits from others is part quality, fit, documentation and support. Included is all components required to make a working amp: JJ 12AX7 and EH 12BH7; Mallory or ETR caps; CARBON FILM resistors; SWITCHCRAFT jacks, ALPHA volume pot; BELTON Micalex tube sockets; 1/8″ thick GP03 eyelet Board; 22 gauge hook-up Wire; BELDEN Co-Ax cable; All Mounting hardware, spacers and nuts; Powder coated in Red Sparkle, Pre-Cut, Die Cast Aluminum Enclosure with black TriFly motif and control lettering; Enclosure has tapped holes for tube mounting screws; Vintage style control knobs; Assembly guide; large 11″ X 17″ size layout and schematic drawings and REAL Support. The Enclosure design and transformer location protects the amp so that a cabinet is not required. TriFly amplifiers are built using point-to-point wiring using eyelet board construction for optimal service and reliability. High-quality tubes, coupling capacitors and resistors are selected for maximum tone, performance and reliability. The Trinity Amps power transformer and output transformer are all custom built and selected for maximum tone, performance and reliability. Also included is our custom made Transformer set made by Heyboer to our exact specifications. No corners were cut on this design! Weight: Head: 2 lbs., 110 Combo 15 lbs. The TriFly really shone in the tone tests the best example was when using the Ash body Tele, on the neck pick-up. Under the vast majority of situations, this arrangement would be very hard to listen to, yet the TriFly made it sound nice! With the Gretsch Country Gentlemen you could hear the detail of the hollow body in the sound. It was quite glorious! 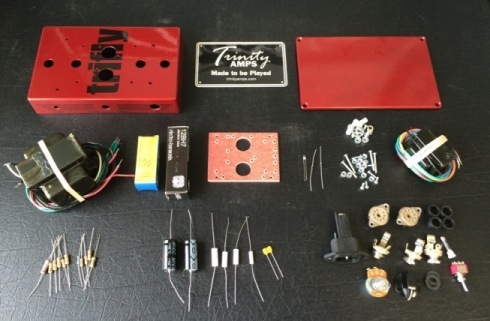 TriFly kit includes tubes and all components except speaker and cabinet.